During a short in-office procedure, we will insert the patented Silhouette InstaLift sutures to lift the deeper layers of the skin in your mid-face or cheek area. The treatment does not require general anesthesia, and takes approximately 45 minutes. You will see immediate lifting with volumization over time and recovery time is minimal. The unique Silhouette InstaLift sutures are naturally absorbed by your body over time and stimulate the production of collagen to aid in healthy skin renewal for natural-looking, long lasting results. 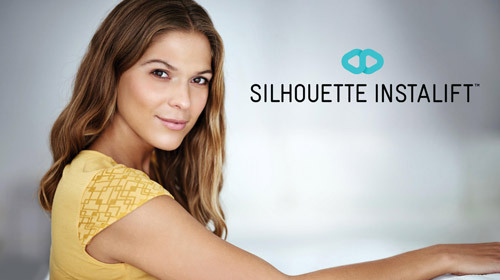 Call us now for a consultation at Siperstein Dermatology to find out if Silhouette InstaLift is right for you. Why should I choose Silhouette InstaLift? How much of a lift will I have? As with any anti-aging procedure, the expectations vary by patient. The results are determined by the amount of skin laxity you have, how many sutures are used in the procedure, and where the sutures are placed. This is a simple, short office procedure that takes anywhere from 30 to 60 minutes depending on how many sutures are used. One of the most exciting aspects of this procedure is that there is no need for general anesthesia! Your dermatologist will locally numb the area and then insert the Silhouette InstaLift sutures. The physician will then lift the skin with the sutures and remove any extra suture that is not needed. Since there is no cutting of the skin, there is no need for stitches outside the skin. When the procedure is done you will not be able to see any sutures. Are these sutures safe and what are they made out of? Yes, they are safe. The delicate design of the sutures was developed by scientists using cosmetic surgeon expertise. They are made from Polyglycolide/L-lactide (PLGA) – a well-tolerated, resorbable material that has been used for many years in the medical industry. 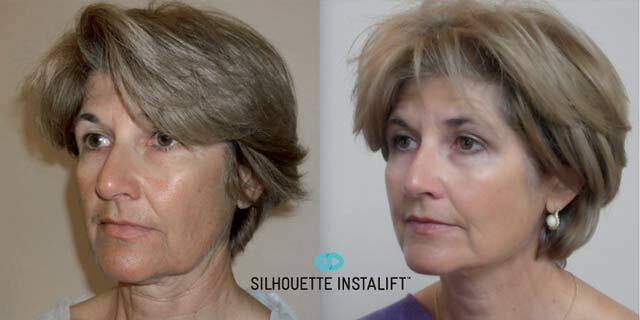 Silhouette InstaLift is branded as Silhouette Soft outside the U.S. where it has been successfully used since 2013. While the suture work to pull up the sagging skin, the cones hold it in place, which allows for immediate result. In addition, they also stimulate the body to produce collagen that is depleted over time from the aging process. Is there really no cutting of the skin? Yes! No cutting or stitches are required, because for each thin suture there is only one needle entry point. This also helps speed up recovery time significantly. How long do the InstaLift results last? While results vary, on average they last for roughly 18 months. Once the sutures dissolve, your natural aging process will continue, much the same as if you did not have any treatment or surgical face lift. Are InstaLift and Thread Lift similar? No, they are not similar procedures. Previously, suture lifts or Thread Lifts used permanent sutures which were barbed. The design of the permanent barbed suture was not successful and this outdated procedure was eliminated as a treatment option. InstaLift uses biodegradable sutures with soft cones that hold the skin in place and which dissolve over time for a safer treatment. Will I be a good candidate for Silhouette InstaLift? To find out if you are a good candidate for Silhouette InstaLift, call us today for a complimentary consultation and assessment.